English-born Laura Watson was raised as a true nomad. Moving to the Philippines and other exotic locations at a young age made her realise that people were what made up the world, since then she has been looking behind the lens. 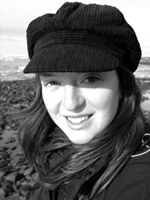 Laura graduated in 2004 from Nottingham Trent University with a degree in Fine Art. After graduating she decided to travel the world and having recently returned from China and India she is staging an exhibition in London based on the issues the Tibetan community face. My second exhibition at the Ritzy is on! Reza Deghati an Iranian Photojournalist who has won a bag full of awards!